Ear cartilage piercings look great and there are lots of different placements to choose from. There are at least eight different ear cartilage piercings that you can get, which makes them extremely popular and a great choice regardless of how many piercings you have. Cartilage piercings heal well and are easy to take care of, but they do take longer to heal than “softer” piercings such as ear lobe and lip piercings. This is because the ear cartilage does not receive as much blood supply. Most ear cartilage piercings heal in six to eighteen weeks and require very little care once fully healed. 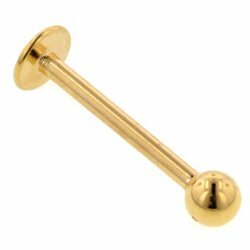 As with all body piercings, it is important to visit a dedicated professional piercer for your ear cartilage piercings as opposed to a hairdresser or jewellery shop. A dedicated piercer will have the proper training needed to perform your piercing correctly with a needle, as opposed to a piercing gun. Piercing guns harbour germs and bacteria because they cannot be fully sterilised. They can also damage the cartilage and lead to a more difficult healing process. Like all body piercings, new ear cartilage piercings should be kept clean and dry. You should clean your piercing twice daily with saline solution and avoid submerging it in water. Keep your hair away from the piercing and try not to fiddle with it. Your ear cartilage piercing should feel progressively better, but consult your piercer if you experience any of the following: swelling, persistent redness, increasing/sharp pain or skin that feels hot to touch. These can be signs of an infected piercing and need to be dealt with immediately. When it comes to infection, cartilage piercings require a little more vigilance – it is possible for infection to trapped in between the layers of cartilage and actually destroy it. Most piercing-related infections can be prevented with proper aftercare, but it is important to be aware of the risks and symptoms. This entry was posted in Body Piercing Aftercare, Body Piercing Education, Ear Piercings and tagged Body Piercing Care, Cartilage Piercing Jewellery, Cartilage Piercings, ear cartilage piercing, Ear Cartilage Piercing Aftercare, Ear Piercing Aftercare, How To Care For Body Piercings, Piercing Aftercare on June 11, 2013 by Piercing Guru. A cartilage piercing is located on the ear. Cartilage piercingsÂ includeÂ the tragus piercing, auricle piercing, rook piercing, helix piercing, snug piercing or pinna piercing. Cartilage piercing jewellery comes in a fabulous variety of funky designs, with unique charms and patterns to choose from to keep your cartilage piercing in style! Read more about other ear piercings on our blog! 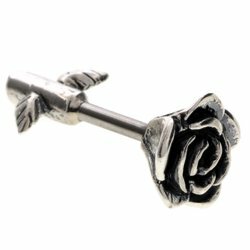 Our extravagant rangeÂ Â of piercing jewellery specifically designed for cartilage piercings includes a very unique choice of cartilage studs, featuring many differentÂ designs that create a very unique and stylish look.Â Cartilage piercing jewellery includes many different designs from roses, jewels and delicate, glamorous charms to the more classic hearts and stars. Don’t foget to read about cartilage piercing jewellery on our blog! Cartilage piercings are difficult to stretch and are most often kept at small sizes, such as 1.2mm or 1.6mm. Check out our fantastic range of fake ear plugs that can be worn in your cartilage piercing to create the illusion of a stretched cartilage piercing! Read this fantastic diary of the snug cartilage piercing, to find out more about the process of piercing and healing cartilage piercings! This entry was posted in Acrylic Body Jewellery, Ball Closure Rings, Barbells, Blackline Body Jewellery, Circular Barbells, Ear Piercings, Ear Studs and Earrings, Gold Body Jewellery, Labret Studs, Surgical Steel Body Jewellery, Titanium Body Jewellery, UV Body Jewellery, Zircon Gold Body Jewellery and tagged Cartilage Body Jewellery, Cartilage Piercing, Cartilage Piercing Jewellery, Cartilage Piercings, Cartilage Ring, Cartilage Studs on July 12, 2010 by Piercing Guru. There are many different ear cartilage rings that you can wear in your piercings, from classic steel BCRs to funky colours and jewelled rings that really stand out. Ear cartilage piercings need well-fitted jewellery so I recommend that you measure your piercing before buying a new ear cartilage ring. Once you know the correct size the fun part is choosing some cool new jewellery for your cartilage piercing. Ball closure rings are one of the most secure type of ear cartilage ring because they are difficult to open and cannot simply fall out of your piercing. There is a huge choice of BCRs available in many different colours and materials, so it is easy to find one that suits your needs. 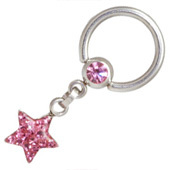 Plain BCRs are the most popular ear cartilage rings but you can also find funky designs like the star ring below, which has a sparkly charm. 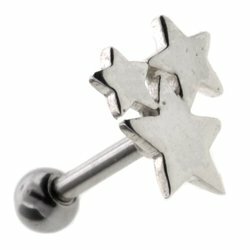 Cartilage rings like the star one are best suited to helix piercings, where the charm can dangle freely and will not irritate your ear. This entry was posted in Ball Closure Rings, Circular Barbells, Ear Piercings and tagged Cartilage Body Jewellery, Cartilage Jewellery, Cartilage Piercing Jewellery, Cartilage Ring on June 16, 2010 by Piercing Guru. Whether you have a tragus, helix, conch or pina piercing, ear cartilage studs are a real must-have. These little ear studs are great for keeping cartilage piercings healthy, they are comfy to wear and come in a huge choice of cool designs. Most ear cartilage studs are actually labret studs, which have a flat back-plate. 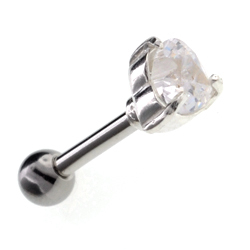 This makes them very comfortable because the back of the stud will not poke or irritate your skin. Another advantage is that the front of these studs screws on, so they canâ€™t fall out of the piercing. This great if you have an active lifestyle, wear headphones or hats that could brush a regular earring out of your ear. There are many different types of ear cartilage studs but Iâ€™ve collected some of my favourites below. These plain ear cartilage studs are simple and stylish. They look great and are unlikely to catch on clothing or yet tangled up in long hair. I recommend these studs for work and smart occasions, or if your ear cartilage piercing is easily irritated. The smooth shape of these studs means that they wonâ€™t get caught on things or accidentally knocked â€“ giving your piercing the chance to heal properly. 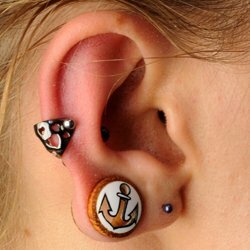 This entry was posted in Ear Piercings, Ear Studs and Earrings and tagged Cartilage Body Jewellery, Cartilage Piercing Jewellery, Cartilage Studs, ear cartilage piercing, Ear Piercing Studs, Ear Studs on May 25, 2010 by Piercing Guru. Choosing the right industrial piercing jewellery can have a huge effect on how your industrial piercing heals but fortunately there is a great choice of jewellery out there, so you can make sure your industrial piercing feels and looks great. 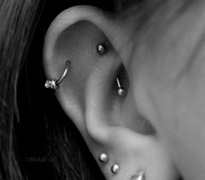 Industrial piercings consist of two ear-rim piercings with one bar worn through both piercings. 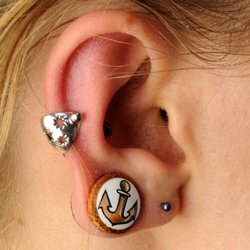 They can be pierced straight across the ear horizontally or at any angle. 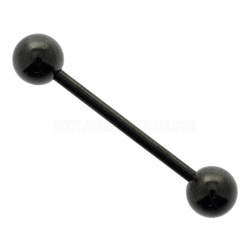 Industrials look amazing and there are lots of different bars you can wear in yours. The key thing to remember is that your industrial piercing jewellery must fit correctly â€“ badly fitting jewellery can put pressure on the piercings, resulting in discomfort, rejection or migration. Luckily all you need to do is measure the length of barbell you need. To find this out measure a bar you already have or measure across the piercing, from the outside of one piercing to the outside of the other. 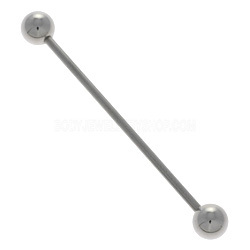 The simplest and easiest kind of industrial piercing jewellery is a plain barbell. You can get your industrial piercing done with a plain barbell and they offer a clean, simple look for smart occasions. 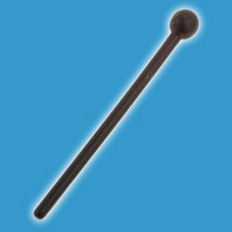 Any barbell can be worn in an industrial as long at it is big enough â€“ never wear a barbell that is too short in your industrial piercing! This entry was posted in Barbells, BioFlex Body Jewellery, Ear Piercings, Surgical Steel Body Jewellery and tagged Body Jewellery, Cartilage Piercing Jewellery, Cartilage Piercings, Industrial Barbells, industrial piercings, multi use body piercing tubes on February 26, 2010 by Piercing Guru.